Canadian Pacific's Holiday Train will begin this year's tour Nov. 25-26 in Montreal. Canadian Pacific's annual Holiday Train has delivered cheer and charity to dozens of Canadian and U.S. cities and towns annually since 1999. Watching the brightly lit, 1,000-foot-long train roll into town is a holiday tradition for people on both sides of the border. But, this year's Holiday Train tour will hold particular meaning for Canadians, who've spent 2017 honoring Canada's 150th anniversary. 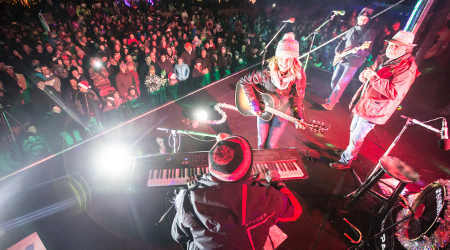 To mark the nation's sesquicentennial, CP earlier this year designated a "Canada 150 Train" that traveled across the country, making 13 whistle stops at community block parties featuring entertainment by Canadian country singer Dean Brody. At each stop, CP officials invited Canadians to write their hopes for the future on stickers that were then posted on one of the train's coach cars. Dubbed the "Spirit of Tomorrow" car, it is now covered in stickers and will be among the 14 cars that make up this year's Holiday Train, said CP spokesman Andy Cummings in an email. The stickers include one placed by Canada’s Prime Minister Justin Trudeau and his daughter, Ella Grace. Musicians entertain attendees of CP's annual Holiday Train. 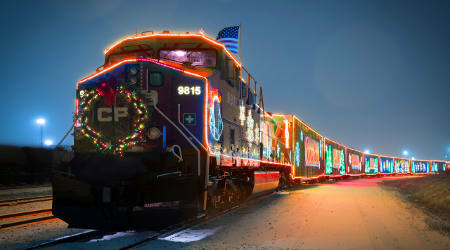 CP operates two Holiday Trains, one that travels in Canada and the other in the United States. The trains will depart Nov. 25 and Nov. 26 from Montreal, visit 182 communities along CP’s network and wrap up Dec. 17. People who visit the train stops are asked to bring nonperishable food items or money to donate. Musical guests Colin James and Emma-Lee will kick off the Canadian leg of the tour on Nov. 26 in Montreal and will perform until the train reaches Calgary, Alberta. Alan Doyle and the Beautiful Band will take over in Calgary and continue the journey to Port Moody, British Columbia, CP officials say. CP launched the Holiday Train tradition 18 years ago after surveying its employees on the charitable causes they'd like to see the company support. "What we heard back was that issues of hunger and food security were universally important regardless of where [the employees] were based or lived," said Cummings. "We built the program to serve the need they saw, a need that unfortunately continues to exist in communities all across North America." The CP Holiday Train's mission has remained constant ever since: to raise as much money, food and awareness as possible in the fight against hunger, Cummings added. Money raised and food collected stay in the communities where the train visits. Holiday Train organizers — who start planning in late winter for the following season's festivities — talk with representatives in each town, village or city to identify a local food pantry that will help distribute the donations collected along the train’s journey. In addition, CP makes a financial contribution to food banks located in communities along the route. Over the past 18 years, the Holiday Train has raised more than CA$13 million and 4 million pounds of food for food banks across CP's network, Cummings said. Although the Holiday Train's mission has remained the same, the train itself has grown longer and brighter. In the beginning, it was made up of a few boxcars and some intermodal cars with containers decorated with screw-in-style light bulbs. An entertainment stage at each stop was set up on the ground next to the train. 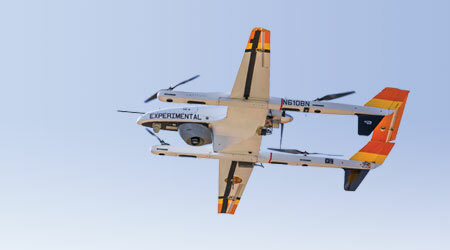 "Now we have a more modern fleet of dedicated boxcars with industry-leading custom LED lighting and a custom designed stage car converted from a boxcar with drawbridge-style mechanical doors and custom audio components designed for concerts," said Cummings. Today’s 14-car train is about 1,000 feet long and decorated with hundreds of thousands of lights and holiday designs. On each side of the stage cars, the doors open and transform into a platform for musicians to entertain the crowds on either side of the train. Entertainers scheduled to perform on the 2017 Holiday Train's U.S. tour include musicians Jim Cuddy, Devin Cuddy, Kelly Prescott, Terri Clark and Dallas Smith. CP isn't the only Class I to run holiday-themed trains with a charitable mission: BNSF Railway Co. and Kansas City Southern both operate trains dubbed the "Holiday Express," while CSX conducts its "Santa Train." BNSF has presented its Holiday Express specifically for military members and their families for the past 10 years. BNSF's Holiday Express is organized for military families. 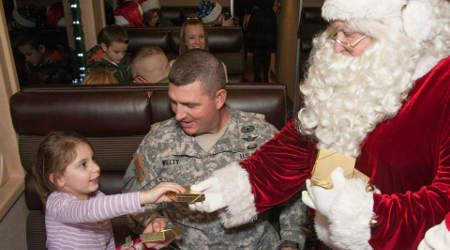 "Since its inception, the Holiday Express has hosted over 25,000 military personnel and their families, and the BNSF Railway Foundation has contributed about $750,000 to local charities that support military families," said spokesman Andrew Johnsen in an email. The train consists of 12 to 14 coach, dome, dining and lounge cars that are fully decked out in a holiday theme. Two shiny orange Tier IV BNSF locomotives power the train, which features Santa and other holiday characters to entertain passengers. Each train trip runs about 90 minutes with 300 to 350 military personnel and their family members on board. BNSF began the holiday service at a time when the United States was active in two wars. 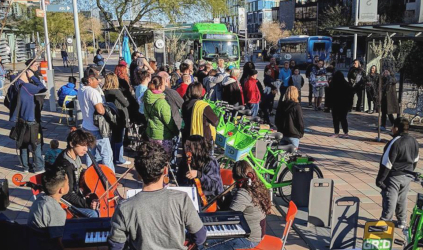 "With so many people deployed at that time, it was important to find a way to help connect the family members on the train trip with those deployed overseas," said Johnsen. A photographer is on board each trip to photograph the families enjoying the festivities; those photos are then quickly uploaded to a private website for their deployed loved ones to see. This year's BNSF Holiday Express route will begin in Temple, Texas, and travel to Fort Worth; Oklahoma City; and Springfield and Kansas City, Missouri. For security reasons, the train’s schedule is not publicly disclosed, Johnsen said. Tickets are allocated by staff at state National Guard headquarters and military bases, with priority going to families with a military member who is deployed, just returned from a deployment or is about to leave on deployment. Meanwhile, CSX's 75th annual Santa Train will make its 110-mile journey on Nov. 18. The train will stop in 12 locations between Pikeville, Kentucky, and Kingsport, Tennessee. This year's ride will feature country music legend Ricky Skaggs, who will help CSX and other Santa Train event sponsors distribute about 15 tons of toys, food, winter clothing and other gifts to residents in need along the route. 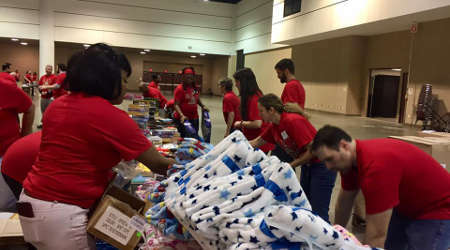 CSX Santa Train helpers prepared the gifts at a recent "Packing Party." As the Santa Train's lead sponsor, CSX provides the train, staffing and many of the toys handed out each year, said Santa Train spokesperson Laura Phelps in an email. Other sponsors that help fund and organize the event include the Kingsport Chamber, Food City, Soles4Souls and Appalachian Power. The Santa Train tradition was started 75 years ago by the Merchants Bureau of Kingsport — now the Kingsport Chamber — and the Clinchfield Railroad, a CSX predecessor railroad. "[They] started the Santa Train as a way to thank people who traveled to Kingsport throughout the year to do their shopping," said Phelps. "Now, the CSX Santa Train is all about tradition and helping the thousands of people in Appalachia celebrate the holiday season." This is the 17th year of the Kansas City Southern Holiday Express, which will arrive at its first station on Nov. 24 in Victoria, Texas. The festively decorated six-car train will deliver $172,500 in gift cards to The Salvation Army along the route, which features 22 stops in six states over 26 days. The cards are used to purchase warm clothing and other necessities for children in need, according to KCS spokeswoman Doniele Carlson. The smiling face of "Rudy" leads the KCS Holiday Express. Money to purchase the cards is raised through KCS employee donations and contributions from the Kansas City Southern Charitable Fund and several corporate sponsors. This year, the KCS Charitable Fund donated an additional $5,000 for gift cards that will be distributed in some of the communities affected by Hurricane Harvey this fall. Led by the Southern Belle business train, the KCS Holiday Express features a smiling tank car named "Rudy;" a flat car carrying Santa's sleigh, reindeer and a miniature village; a gingerbread box car; an elves' workshop; a reindeer stable; and a little red caboose. Each car is illuminated with colored lights and decorations; visitors are invited to tour six of the train's cars. A number of other railroads also have holiday-train traditions for charity. Following are a few planned for this year. If you know of other railroads that operate special trains with a charitable mission during the 2017 holidays, please send an email to julie.sneider@tradepress.com. Indiana Rail Road: The 28th annual Santa Train will travel Dec. 1-3, making 12 stops across southern Indiana and eastern Illinois. 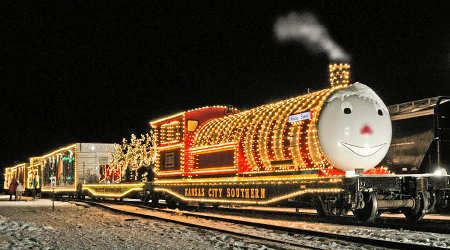 The event offers a limited number of families to hop on board a festively decorated train to meet Santa and Mrs. Claus. The railroad uses the event to distribute winter coats and hats to children who need them. The 2017 Santa Train schedule is available here. Caltrain: Serving the San Francisco Bay area, the Caltrain Holiday Train is presented by the Silicon Valley Community Foundation. This year's train is scheduled to visit train stations from San Francisco to Santa Clara, California, on Dec. 2-3. The tradition features a glittering train, a community toy drive and characters to entertain families at stops. Visitors are asked to donate a new, unwrapped toy to the Toy Drive. The 2017 Caltrain Holiday Train schedule is available here. Virginia Railway Express and Operation Lifesaver: Virginia Railway Express (VRE) and Operation Lifesaver join to present the annual Santa Train excursion as a way to promote rail safety and the "Look, listen and live" campaign. Tickets will go on sale Nov. 20 for the Dec. 9 event for children and their parents to ride a train and meet Santa and Mrs. Claus. In addition to promoting rail safety, Operation Lifesaver works with the Marine Corps’ Toys for Tots program. On Dec. 9, VRE’s Spotsylvania, Fredericksburg, Manassas, Burke Centre and Woodbridge stations will serve as a drop-off site for the Toys for Tots campaign. The train schedule is available here. Florida East Coast Railway (FEC): The Christmas Train will make its 8th annual trip Dec. 9 in Florida. The FEC Christmas Train is run in coordination with the U.S. Marine Corps Toys for Tots Foundation and travels from Jacksonville to Miami along FEC Railway’s 351-mile mainline track. Along the way, Santa Claus will be spreading holiday cheer. Click here for the train's schedule.